SFC Christopher Celiz died of wounds sustained as a result of enemy small arms fire in Zurmat district, Paktiya province, Afghanistan. 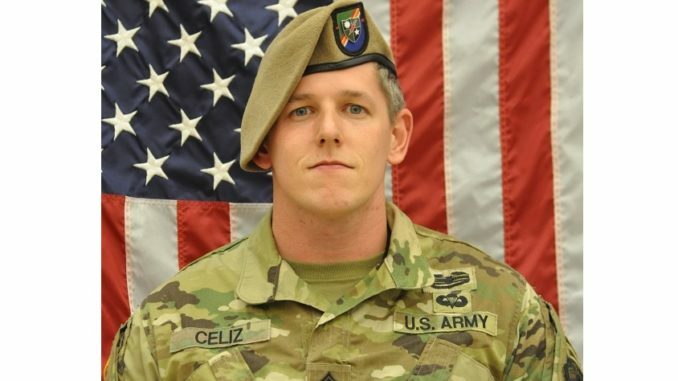 Celiz was assigned to Company D, 1st Battalion, 75th Ranger Regiment based at Hunter Army Airfield, Georgia. He was part of U.S. – Afghan operation to clear insurgents from a Taliban influenced region of Afghanistan. He was wounded by enemy small arms fire. He was treated immediately and medically evacuated to the nearest medical treatment facility where he died of his wounds. SFC Christopher Celiz was born in 1986 in South Carolina. He enlisted in the U.S. Army in September 2007. His initial training took place at Fort Leonard Wood, Missouri where he attended Basic Combat Training and Advanced Individual Training as a combat engineer. Celiz had tours as a combat engineer at Fort Hood, Texas and Fort Stewart, Georgia. In 2013 SFC Christopher Celiz was selected to serve with the 75th Ranger Regiment as a combat engineer. He served with 1st Battalion as the battalion master breacher and engineer and then later as a mortar platoon sergeant with Company D. At the time of his death Celiz was serving as the battalion mortar platoon sergeant and was in the process of reclassifying to the infantry branch. Celiz deployed from 2008 to 2009 in support of Operation Iraqi Freedom (OIF) and from 2011 to 2012 in support of Operation Enduring Freedom (OEF). He was on his fifth deployment with 1st Battalion, 75th Ranger Regiment when he was killed. He deployed to war zones a total of seven times with the U.S. Army. Celiz’s military education includes the Infantry Mortar Leader Course; Senior, Advanced and Basic Leader Courses; Jumpmaster Course; Sapper Leader Course; Ranger Assessment and Selection Program 2; Basic Airborne Course; U.S. Army Ranger Course; Route Reconnaissance Clearance Course-Sapper and the Combat Lifesaver Course. His awards and decorations include the Joint Service Commendation Medal, Army Commendation Medal (2 OLC), Navy Commendation Medal, Joint Service Achievement Medal, Army Achievement Medals (4 OLC), Meritorious Unit Citation Medals (2), Afghanistan Campaign Medals with Campaign Star (3), Iraq Campaign Medals with Campaign Star (2), Global War on Terrorism Expeditionary Medal, Global War on Terrorism Service Medal, Army Service Ribbon, Overseas Service Ribbon, and the NATO Medal, the Ranger Tab, the Sapper Tab, Combat Action Badge, Parachutist Badge and the Marksmanship Qualification Badge Expert-Rifle. Celiz is posthumously awarded the Meritorious Service Medal, Bronze Star Medal, and the Purple Heart. PRESS RELEASE: U.S. Army Special Operations Ranger Killed in Combat, USASOC, July 13, 2018.